Viral videos are and going to be in vogue. The art is to capture someone’s attention with humorous or informative clips and reach a wider audience through the power of social media. A video tour of the nearby areas gives the potential buyer an overall view and real assurance which makes the decision making process much easier. Additionally, there are every few videos on the same. The key is to use Instagram Stories to give your audience a look at how exactly will the day to day life be in and around the property that you are showcasing. Using snapchat for building a wider audience is possible only through influencer marketing. Ask influencers to solve real time realty issues through snapchat stories. Post about Events in Your Neighborhood. This will not only help your audience know better about the area but also showcase the brand’s alertness and in-depth knowledge about the same. Show your Care About Your Clients. Showing your care for your clients is very essential, that’s how they keep coming back to you. Engage with Contests and Sweepstakes. Contests help develop better relationships and deeper interactions with the audience. As you know, it’s very crucial to know about their likes, dislikes and promote yourselves as a brand that listens. Target specific audience as per your geographical parameters through Facebook. Tweet Tips About Moving and Packing. Twitter is a very good platform to discuss topics outside property promotions. For example: one can teach about how to pack and make a move less stressfully. Twitter is a great place for sharing news. Tweet about every good thing happening in the locality. For example, if a new school is being built in the area – tweet about it. Use @mentions to Keep in Touch with Clients. Twitter features help send tweets to specific people. Leverage that for growing close connections with consumers. For example, congratulate a buyer for his new home. Set Up a Pinterest Board about Your Neighbourhood. Create Board about the amenities, shops and services available in that particular locality where your properties are located. Set Up Boards about Your Lifestyles. Set up boards inspired from the lifestyle you are promising through the various properties you wish to promote. Cross-Promote with a Facebook Pinterest Tab. Cross-promotion between Facebook and Pinterest by getting updates in a Pinterest tab on the Facebook page is a great way to increase social reach. Join local LinkedIn groups and participate in them. This helps you stay connected with your clients, and interact with them on a professional level. Use blogs to get your clients clicking on to your website. Blogs are also great for SEO;they also help keep fresh content coming directly on your website. Infographics present useful data in an attractive and readable format. They work great in real estate marketing as well. 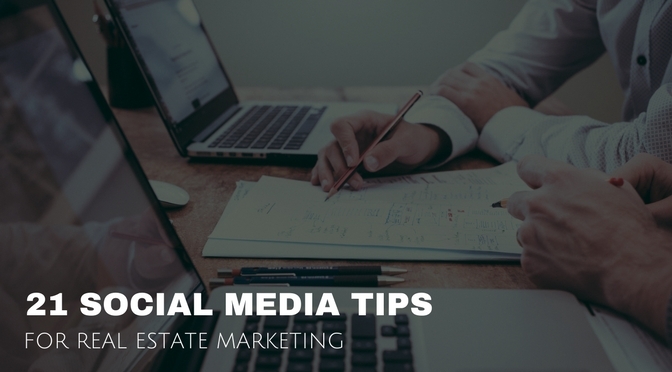 Build a hype on social media before it hits the market. This builds excitement and curiosity among buyers because they are looking out for any new home they can find in key areas. There will always be a question and the sooner you answer those questions, the quicker the client will trust you which will lead to a sale down the line. Craft a subject line that can be the call to action for the reader without giving much information about the mailer.